Kuroshio town is rich in nature, surrounded by green mountains and the deep blue sea. It is a rare town that naturally has Sa-Shi-Su-Se-So. Sa-Shi-Su-Se-So is the basis of Japanese seasoning, Sato-Shio-Su-Shoyu-Miso (sugar, salt, vinegar, soy sauce, and miso). These are the blessings of nature. The seasonings are made by hand, manipulating the ingredients as little as possible, just enough to bring out their amazing taste. These ingredients also have a vital role in keeping people healthy. These natural seasonings are used every day. This is part Kuroshio Town’s natural treasures. Enjoy the unique Kuroshio regional climate and discover the richness of everyday life through seasonings. Organic sugarcane is grown by the Kuroshio Town Irino Sugar Research Group, making brown sugar in a firewood kiln using methods passed down since the Edo period. Unpurified brown sugar is rich in nutrients such as potassium, calcium, magnesium and other minerals, vitamins B1 and B2, and has a special sweetness. 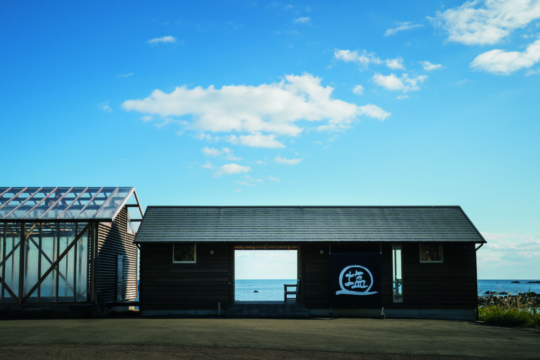 Taken from the ocean, Kuroshio Town’s special salt is made from solar and wind power alone. 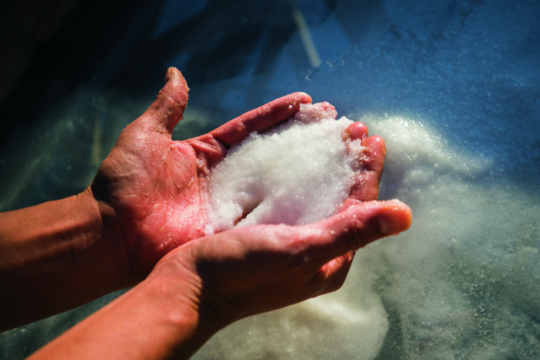 There are several salt-making places in the town where the mineral-rich sun-dried salt is made. It also goes perfectly with katsuo no tataki taken from the same Kuroshio Current. Kochi Prefecture is the Citrus Kingdom. In Kuroshio Town, starting from early spring buntan (pomelo), followed by the summer Bushukan, coming into the autumn sutachibana (sudachi), and finishing with yuzu (Citrus junos) in winter, there is no shortage of vinegar and natural fruit juices. Traditionally, in the houses of the fishermen in Kuroshio Town a fish sauce was made. The homemade sauce is aged and fermented for over half a year by immersing kibinago (silver-stripe round herring) and iwashi (sardines) in sun-dried salt. Its elegant taste has earned it a high reputation in the gourmet world. Miso has been made in many homes throughout the past. In Kuroshio Town, making miso is still popular now. The flavor of homemade miso varies from house to house. Please find your favorite miso.